CORBA has been working behind the scenes on restoring the Gabrielino National Recreation Trail. 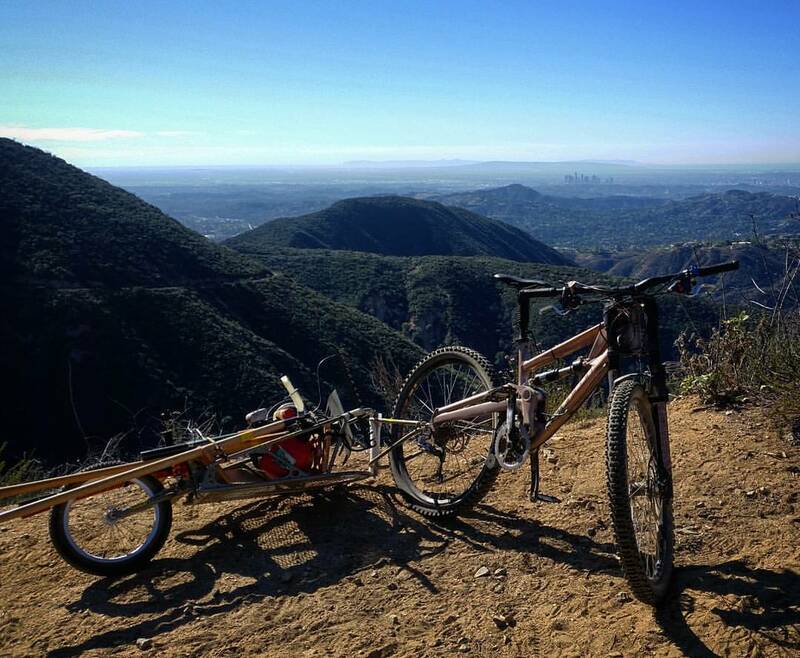 The Gabrielino is the last trail still closed because of damage due to the Station Fire. It’s been an ongoing effort since 2011 to open up sections of the trail and then keep them clear of downed trees. 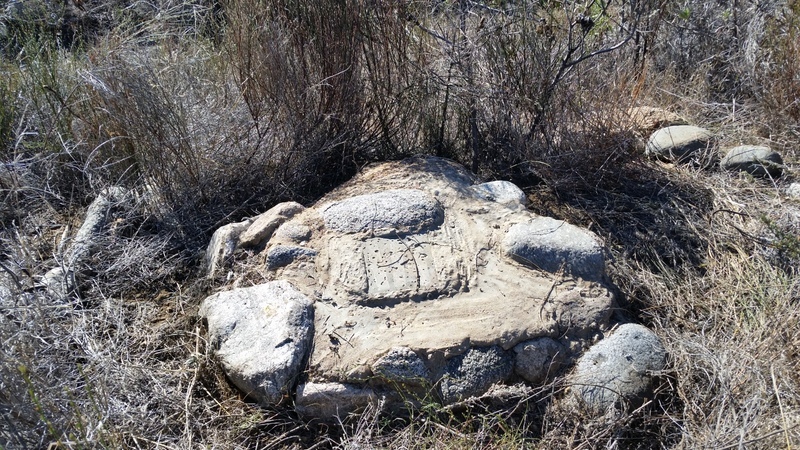 In early 2015 the Los Angeles Conservation Corps worked with Bellfree Contractors to rebuild the Gabrielino from Paul Little to Oakwilde Campground. CORBA helped fund that effort with a generous grant from REI. We subsequently concentrated on the Ken Burton trail, a project that rallied volunteers in an intensive 8-months of bi-monthly work days. 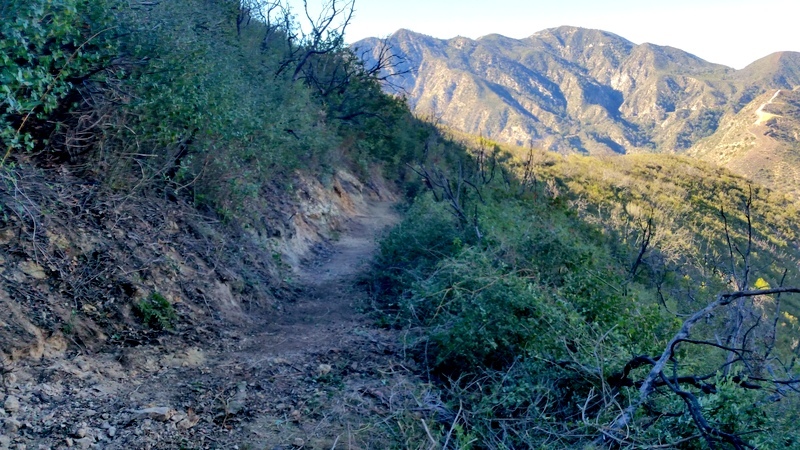 Only the section from Oakwilde to the junction with Bear Canyon trail remains closed to public use. CORBA has been awarded grants from both REI and Edison International to help fund the restoration of this section. Those funds support volunteers, buy tools and materials and will pay for professional services to improve the sustainability of the trail and reduce future maintenance needs. We are grateful for their support. 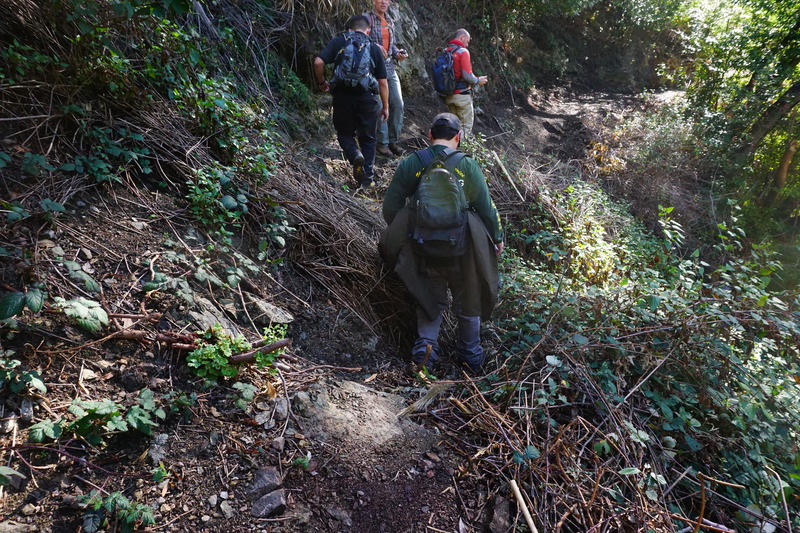 In early 2016 we did a hike-through inspection of the trail with Forest Service staff, Bellfree Contractors, Los Angeles Conservation Corps and Boy Scout volunteers. 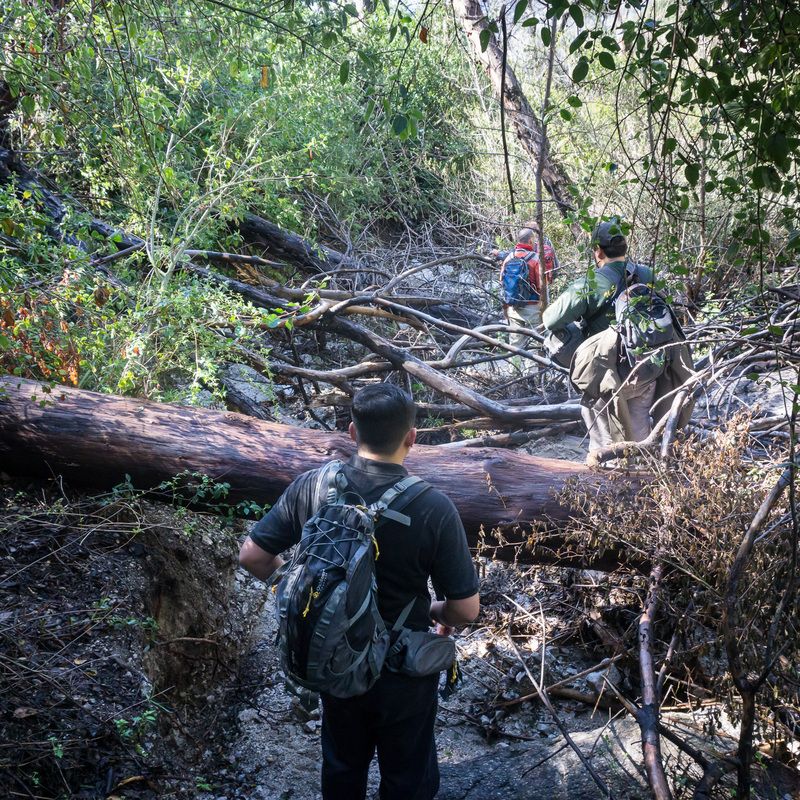 The arduous journey involved climbing over and under dozens and dozens of downed trees, searching for remnants of trail where it had been washed away, and dodging and ducking heavy brush. Sections of the trail were completely gone, the only route was to hike along the streambed, which was also covered in downed trees. After more than a year of internal Forest Service review, the go-ahead was given to us by District Ranger Bob Blount last summer. Sadly, Ranger Bob passed away last week and won’t see this trail completed. He was especially excited for us to be working on this trail and bringing it back to its earlier glory. We hope to finish the project by summer in his honor. After months of extreme fire danger (meaning no chainsaw use), last fall CORBA and MWBA volunteer sawyers spent six solid days wielding chainsaws to cut through the deadfall along the trail. With the corridor opened up, MWBA have devoted their monthly trailwork day to the project since December. In three work days the volunteer crews have worked on just over two miles of the trail. There is so much enthusiasm for getting this trail restored and opened that there have been more volunteers that tools for the last two days. The volunteer effort has been astounding, with more than 40 volunteers signed up each day. Some sections that have been worked on are now in better shape than before the Station Fire. But there is still much to do. So far, over 50 individual volunteers have devoted more than 1000 hours to the restoration effort. This is truly a team effort, with the Angeles Forest 50k Run trail crew having worked on another section of the Gabrielino near Switzers; the Sierra Club have been working on the section around Devore camp; and previous work was done by the Los Angeles Conservation Corps and the Boy Scouts on other sections. Thanks to all the volunteers who have contributed to this restoration effort. 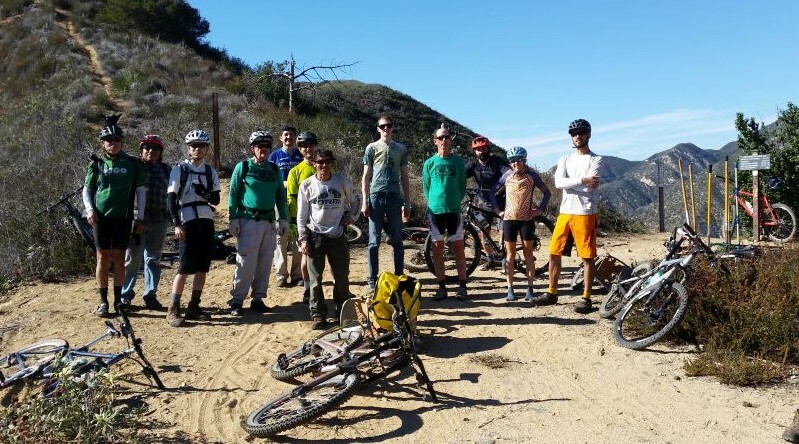 Special thanks to our partners at the Mount Wilson Bicycling Association for organizing group work days and REI and Edison International for their financial support. There is still more to do. 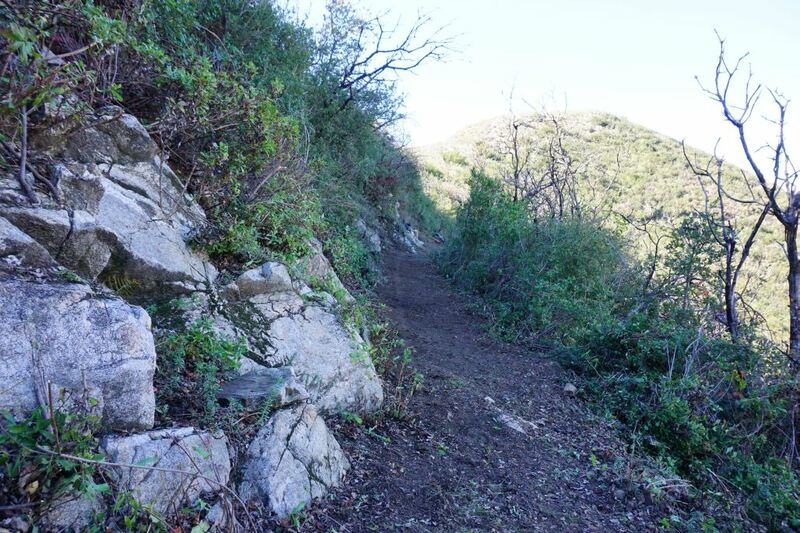 The trail is not officially open to the public, but we hope to change that soon.. Watch for upcoming announcements for March and April volunteer work days from MWBA, or CORBA’s Meetup group. Most of the Sunday, 11/22 crew after they arrived. Thanks guys and gals! 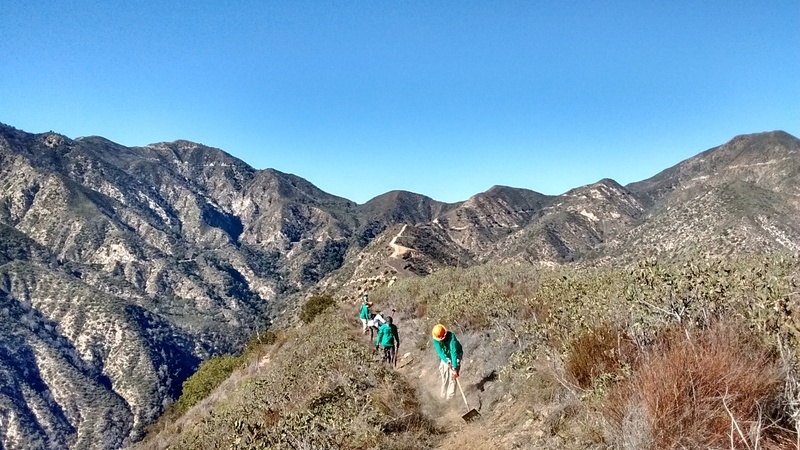 On Sunday, November 22nd, 2015, we had our third full trail restoration work day on Ken Burton trail with the Mount Wilson Bicycling Association. 23 volunteers made the 7 mile, 2000′ climb to pitch in. Bob trailers were used once again to get needed tools and supplies to the work site. We continued on from where we finished last time. The crews worked feverishly for a solid four hours, clearing an additional 1600′ of trail. We’re making rapid progress, thanks in part to the excellent original construction by the Mount Wilson Bicycling Association in the 1990’s. Before: A group who poached the closed trail in 2013. The brush is only thicker and taller now. The before and after is quite dramatic. 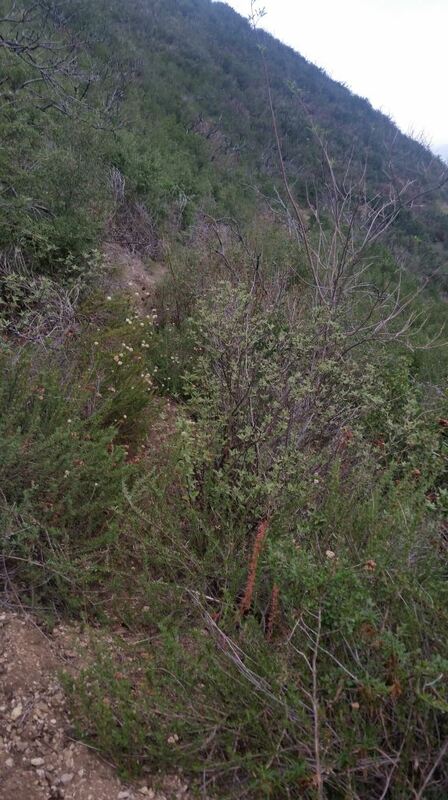 Where the trail was previously completely obscured by brush, it is now in better shape than before the fire. Our crews are getting it down to a fine art. We’re using power hedge trimmers for the initial brush clearance, followed by swampers (who remove and stash the cut brush), then loppers and hand saws to fine tune the brush and stump removal. The lead crew is followed by a tread crew, working to remove stumps and roots from the tread, and pull down slough to restore the original trail tread. We’re cutting the trail to its original 36 – 48″ tread width where possible, knowing that it will narrow down again with time. Ken Burton Memorial. The plaque is long gone. Our target for the day was to reach the Ken Burton Memorial, a plaque dedicated to USFS Battalion Chief Ken Burton, who was killed in a car crash in November 1985. For those who remember the trail, the memorial was just before the very first switchback descending into the Arroyo Seco canyon. We made it to the Memorial at about 1 p.m., leaving time for people to gather tools, load up trailers and ride back down for lunch at 2. Pat Phillips, a local Altadena resident and one of the original construction crew in the 1990’s, graciously hosted us for lunch afterwards. We’ve also reached the first failed retaining wall structure. In my survey of the trail, only two sections of retaining wall structure failed out of the dozens used, a testament to the work of the original MWBA crew. Those dozens of structures have survived three major El Nino winters and one Station Fire. Project Status. Click for a larger view. So far we’ve cleared approximately .7 miles of the trail, about 1/3 of the work. We have a couple more days of very similar work before it will get especially thick and tough near the bottom. At that time we’ll need to coordinate with the Los Angeles Conservation Corps who are working on the Gabrielino trail, near where it meets the bottom of Ken Burton trail. Thanks again to all the volunteers who came out to help. Our next work day is December 13 (weather permitting). Our tentative dates starting next year are January 10 and January 24, to be confirmed soon. The more people who contribute, the better our chances of riding this trail next summer! The Ken Burton trail goes right up the middle of this picture. It’s hard to find. 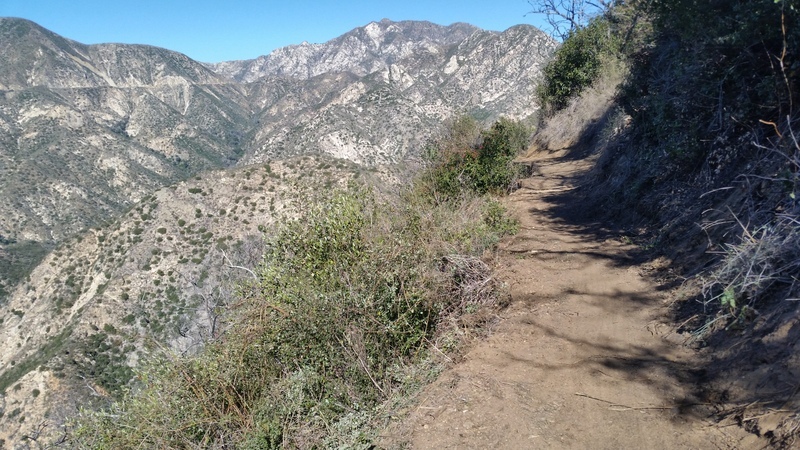 Earlier this year, CORBA used a generous grant from REI to help fund the restoration of the Gabrielino trail to Oakwilde Campground and the Ken Burton trail junction. Pooling resources with the Los Angeles Conservation Corps, CORBA helped fund a private contractor, Bellfree Contractors, to oversee volunteers and Conservation Corps crews, taking the lead on the project. The trailwork needed was so extensive it required the review and approval of Forest Service staff engineers. 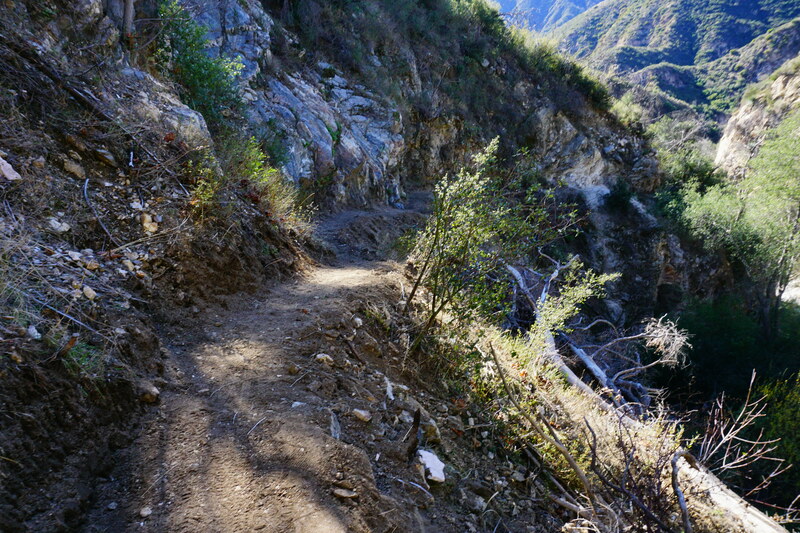 Much of the trail was completely gone, having been swept away in a massive landslide, or gouged into a ten-foot-deep, twelve-foot wide gully where once you could step over a trickle of water as it crossed the trail. 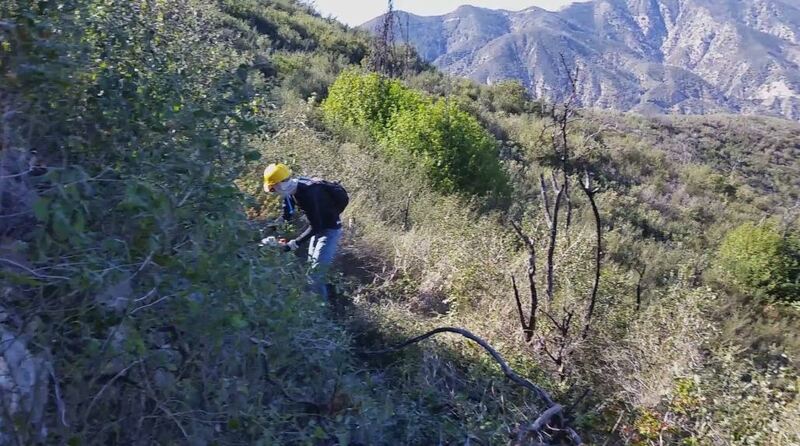 That work was begun last spring, and Los Angeles Conservation Corps continue to work on the Gabrielino in the area. The Trail remains closed to the public beyond Paul Little campground/Brown Mountain Dam while restoration efforts continue. 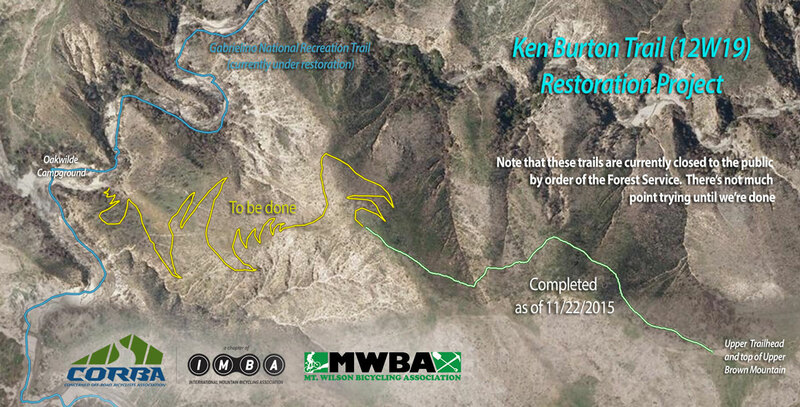 Meanwhile, we were given permission to begin work on the Ken Burton trail earlier in summer. Work began in October with the trail being inspected, and in many cases searched for using older GPS tracks, by CORBA volunteers. On Saturday, November 7th six volunteers came out to begin work on the trail. Just getting to the work site requires a 2000′ climb over 7 miles, with several steep, loose sections that are difficult without carrying tools. In one day’s work, we were able to clear brush from about a quarter mile of trail, and restore tread on just over half of that. The tread, once cleared of brush, is generally filled with loose slough that’s easy to clear, but is otherwise intact. 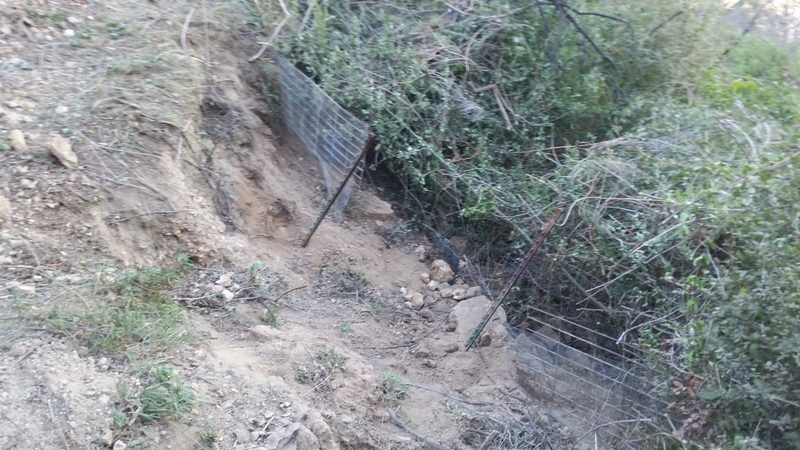 A few retaining wall structures near the top have failed and will require digging out the old materials–iron posts, steel mesh, wire and screen–and replacing them. 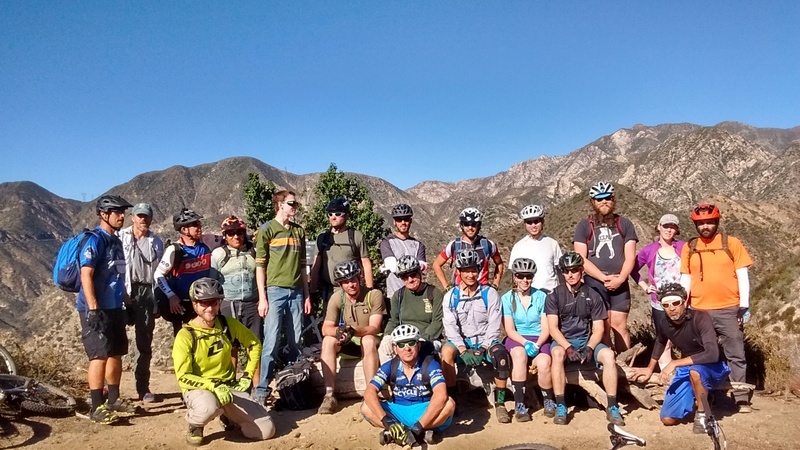 On Sunday, November 8, we worked with the Mount Wilson Bicycling Association’s and had a crew of about 18 come out to begin work. 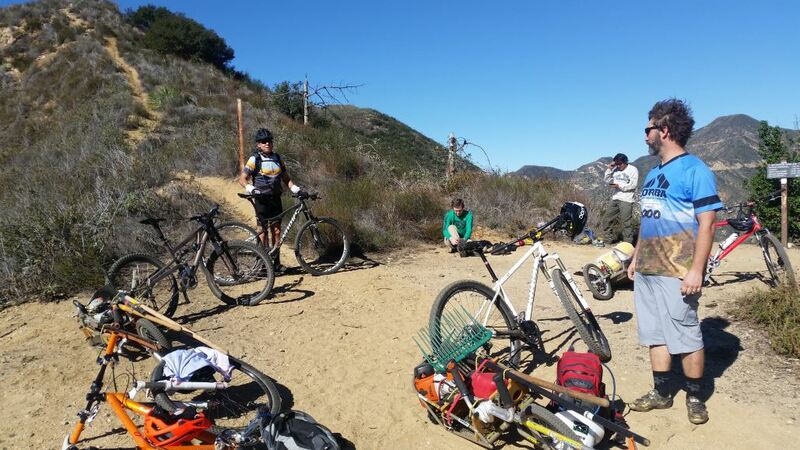 Several volunteers stepped up to haul bob trailers full of tools, no easy feat with over 2000′ of climbing. With hedge clippers doing the initial clearing, followed by a rake or Mcleod to clear the cut brush, followed by a loppers and pick-mattocks to pull roots, and finished off with a nice outsloping by Mcleod, we had it down to a system. The brush on day two was much thicker than the day before, but we were able to clear about another quarter mile of trail, and with the extra hands, do another quarter mile of basic treadwork. Brush was thick and the trail difficult to find in places. After both days of trailwork the crews enjoyed a great meal and some local hospitality. Many thanks to everyone who came out for the work. This trail is special to many people, having been built by mountain bikers, the Mount Wilson Bicycling Association, in the early 90’s. Special kudos to Brad, Burt, Mike, Robin, and Steve who came out both days! We left almost a half mile of the trail looking like this in one weekend. 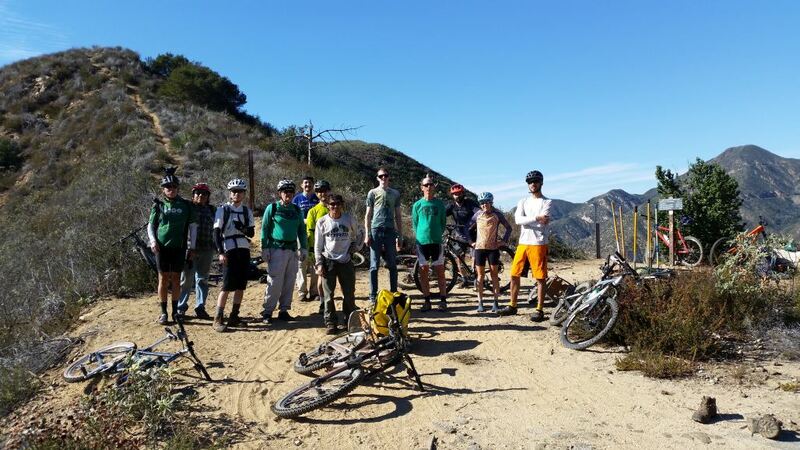 We’ll be back out on the trail this Sunday, November 22, again with Mount Wilson Bicycling Association. And if there’s enough interest (and the weather/fire danger cooperates), another crew could head up on Saturday instead (or in addition!). At the moment, we’re approaching capacity on Mount Wilson Bicycling Association’s Facebook Event. For that reason this weekend’s trailwork isn’t being added to CORBA’s meetup calendar. However, a tentative third weekend on Sunday, December 13 is in the works. Stay tuned for details. The Forest Service requires our volunteers to wear long pants, long sleeves, gloves and hard hats which we supply (and with the thick brush, all that gear is a good idea). These can be carried up in backpacks for the ride up and changed into before we start work. Some of the crew prepare to head back down after a solid days work. Ken Burton trail is closed to the public. Although we’ve started on it, it’s still dead-end with miles of hike-a-bike through heavy unrideable brush and poison oak once you get beyond our short restored section. People have gotten lost trying to find the trail. We’ll continue working on Ken Burton through the winter and coming Spring, with the goal of having it, and the Gabrielino back to Paul Little and JPL, ready to open by the end of Spring 2016. The more involved you stay, the more likely the Forest Service will open the Brown/Burton/Gab loop, an old favorite of many long-time mountain bikers. How we get it done. Bob trailers can haul tools for six people.